The river is still rising, and it has increased 8 inches for last two days. Sounds of shores eroded and falling down a water like a cannon can be heard a few times in a single hour. However a quantity of precipitation might be decreaseing. It has rained a great deal this year, the river has risen, and most of shores that a tent can be pitched have been submerged. 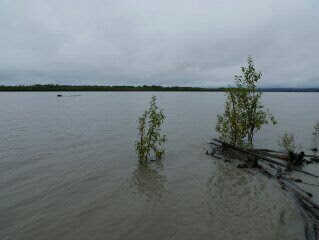 Since most of shores have been covered with driftwoods washed up along the edge of the water, the kayak has not been able to land there. In addition, from September, the storm season will start and the river will rise more then. It is impossible without stay in the tent on the shore to paddle and move forward on the river, so I am considering the second leg will end at next village Grayling. I need more three days to paddle to the Grayling, so I have to find tenting possible shores somewhere and stay two nights. Therefore now I am considering the timing when I should leave here, whether the water level will increase or decrease while waiting.